The study investigated the extent of soil arsenic (As) contamination in agricultural plots in Bengal Delta through contaminated groundwater irrigation. Edaphic levels of As and oxidizable organic carbon (OOC) were tested along a depth gradient (0 to 160 ft) in agricultural plots. Soil samples were collected from surface up to 160 feet depth at every 5 feet. By boreholes drilling and soil arsenic was estimated in ICP-MS. The analysis for estimation of soil OOC was performed. Statistical analyses were performed by one-way ANOVA to determine significant differences between groups at P<0.05. Concentration of As in soil was observed to be highest in surface soil, then decreased with increasing depth till about 40 ft, after which the concentration remained constant. Similar trends were noted for OOC. OOC showed significant (P < 0.05) positive correlations with the As levels. Natural organic matter may enhance the release of As from soils and sediments into the soil solution, and thus can help in As leaching into the groundwater. Detailed investigation of the soil profile and the extent of bioaccumulation in the edible crops are urgently needed in those arsenic-contaminated areas. Arsenic (As) is a metalloid that executes severe environmental threats due to its extravagant toxicity and colossal abundance. It naturally occurs in over 200 different mineral forms, of which around 60% are arsenates, 20% are sulfides and sulfosalts, and the remaining are arsenides, arsenites, oxides, silicates, and elemental arsenic (Onishi 1969). Its source is mainly geological, but anthropological activities like mining, burning of fossil fuels, and uses of pesticides also lead to arsenic contamination (Bissen and Frimmel 2003). It is a potent endocrine disruptor and can alter hormone-mediated cell signaling even at extremely low concentrations (Kaltreider et al. 2001). The permissible limit for As in water is 10 ppb, as recommended by the World Health Organization (WHO World Health Organization 2001). Its concentration in most rivers and lakes are below 10 ppb and that of the groundwater is about 1 to 2 ppb, except in areas with volcanic rock and sulfide mineral deposits (World Health Organization 2001). Contamination of As in groundwater has been widely reported in Bangladesh, India, China, Taiwan, Vietnam, USA, Argentina, Chile, and Mexico (WHO World Health Organization 2001). Among these, the Bengal Basin (of eastern India and Bangladesh), which holds more than a hundred million inhabitants, is regarded to be the most acutely arsenic-affected geological province in the world (Mukherjee et al. 2008). The use of As-contaminated groundwater for irrigation of crops in this region elevates arsenic concentration both in the surface soil and the plants (Mandal et al. 1998; Meharg and Rahman 2003; Roychowdhury et al. 2005). Soil arsenic levels are very much related with local well water arsenic concentration, which suggests that the source of soil contamination is the irrigation water (Bhattacharya et al. 2012). The absorption of arsenic by plants is influenced by the concentration of arsenic in the soil. In Bangladesh, where irrigation is carried out with arsenic-contaminated groundwater, soil arsenic level can reach up to 83 mg/kg (Roychowdhury et al. 2005). Arsenic is associated with the primary sulfides: (hydro) oxides of Al, Fe, and Mn; clays; sulfates; phosphates; and carbonates in the Bengal Delta Plain (Foster 2003). Arsenic is released in the soil by weathering of arsenopyrite (FeAsS) and sulfide minerals. The grain sizes of soil particles play an important role in controlling the distribution and mobility of arsenic. The surface area of the fine-grained particles is large, and hence, they can adsorb more arsenic (Bhattacharya et al. 2007). For this reason, clay minerals and Fe, Al, and Mn (hydro) oxides are important sinks for arsenic in the aquifers and sediment layers in Bengal Delta. Arsenic in soil normally occurs in pentavalent state under oxidizing conditions while under reducing conditions trivalent As(III) species prevail that is more mobile and bioavailable (Bhattacharya et al. 2012). The enrichment of arsenic in soil is primarily due to its co-precipitation not only with or sorption on poorly crystalline Fe oxyhydroxides which precipitate from the irrigation water but also to sorption on other components (including crystalline Fe oxides and hydroxides, clay minerals, and organic matter) of the soil matrix (Bhattacharya et al. 2007). However, the relation between arsenic and soil organic matter does not necessarily imply that the fixation of arsenic is controlled by organic matter but is rather due to the fact that the vertical distribution of both arsenic and organic matter depends on their penetration depth into the soil (Norra et al. 2005). The study was performed at Kalinarayanpur (23°22’N, 88°56’E), Nadia, West Bengal, India. The region is considered to be among the severely arsenic-affected zones of Bengal Delta (Chakraborti et al. 2002). The agricultural system in this region is mostly dependent on irrigation with As-contaminated groundwater obtained from a depth ranging from 70 to 600 ft through tube wells. Huge amount of groundwater is used for agricultural irrigation. Much of this groundwater is contaminated with arsenic, which is deposited in the soil in contact with the irrigation water throughout the year. Analyses of As and OOC in soil were performed in soil samples obtained from agricultural plots irrigated with groundwater. Boreholes were drilled using a conventional household technique by hand percussion and reversed circulation. Though the method allows a continuous recovery of the drilled material, it allows only the collection of disturbed bulk samples (Horneman et al. 2004). Soil samples were collected from surface up to 160 ft depth at every 5 ft. All samples were packed in individual air-tight polyethylene bags and stored at 4°C for further analysis. Estimation of soil As was performed by inductively coupled plasma-mass spectrometry (ICP-MS). Collected soil samples were dried in open air under diffused sunlight followed by drying in hot-air oven at 50°C for 24 h. Each sample was then ground manually with a mortar and a pestle to form a fine powder, which was passed through a sieve to get homogenized sample particles. Five milliliters of 2 M H2SO4 was added to about 1 g of prepared soil sample powder, vortexed for 1 min, and centrifuged for 5 min at 1,500 rpm. The supernatant was then decanted and analyzed for total arsenic by ICP-MS using an X Series II ICP-MS (Thermo Scientific Inc., Waltham, MA, USA). The operating conditions for the ICP-MS analysis were as follows: Rf power: 1,400 W, cool gas: 13.0 L/min, auxiliary gas: 0.9 L/min, nebulizer gas: 0.95 L/min, spray chamber temperature: 3°C, sampling and skinner cone: Ni, expansion chamber pressure: 1.9 bar, analyzer chamber pressure: 3.6 × 10−7 mbar, nebulizer back pressure: 2.1 bar, sampling depth: 150 mm, detector mode: pulse, element monitored: 75As. The Thermo PlasmaLab ver. 2.5.5.290 (Thermo Scientific Inc.) software was used to evaluate the concentrations of As in the different soil samples obtained from different depths (0 to 160 ft). All analyses were carried out in triplicates. Data were presented as mean ± standard deviation. Statistical analyses were performed by one-way ANOVA to determine significant differences between the groups at P < 0.05. Estimated correlations were tested for significance by Student's t test at the same confidence limit. MATLAB ver. 7.0 (Natick, MA, USA), SPSS ver. 9.05 (Chicago, IL, USA), and Microsoft Excel 2007 (Roselle, IL, USA) were used for the statistical and graphical evaluations. The ICP-MS data revealed that the soil samples had varying levels of As from the surface to a depth of 160 ft. 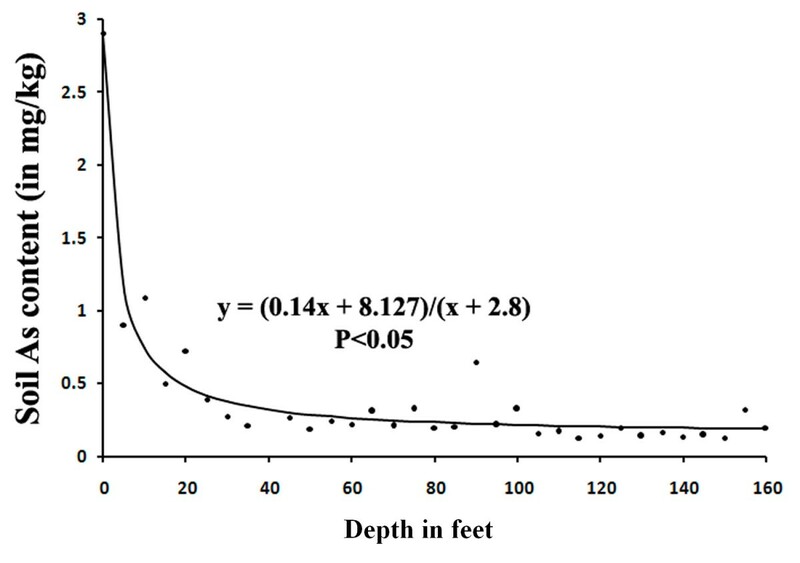 Figure 1 illustrates that As levels significantly (P < 0.05) decreased from the surface (2.89 mg/kg of soil) till a depth of about 45 ft (0.3 mg/kg); following which, there was a constant concentration of As along the gradient of increasing depth. Hence, the surface level of As was approximately ten times greater than that observed at a depth of 45 ft or greater. Interestingly, OOC in soil showed a gradual decrease with depth till approximately 45 to 50 ft (Figure 2) and then showed constant levels beyond 45 to 50 ft depth. These results were identical to the trend that was observed for the soil As content. 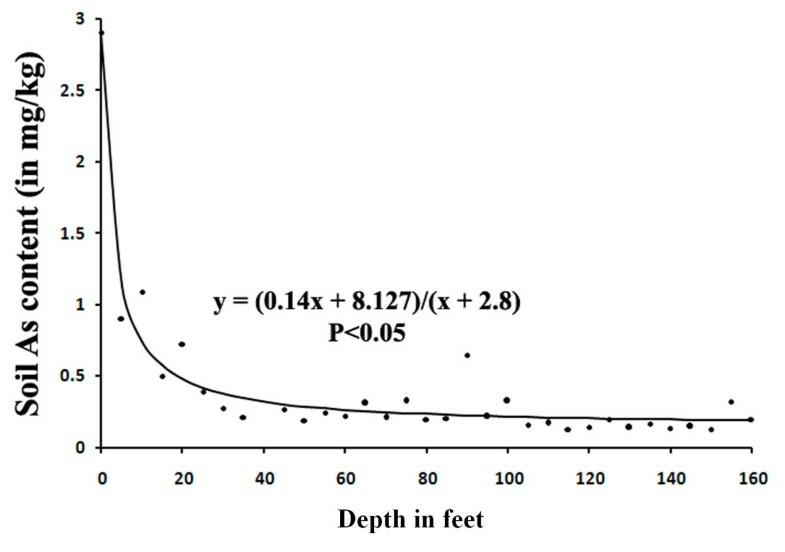 Trend of As imbibition along the depth gradient of soil from the surface to 160 ft. As levels were observed to decrease up to a depth of 45 ft (approximately), beyond which the level remained stable. Data expressed at P < 0.05. Changes in the percentage of OOC with increasing soil depth. Data are presented at P < 0.05. 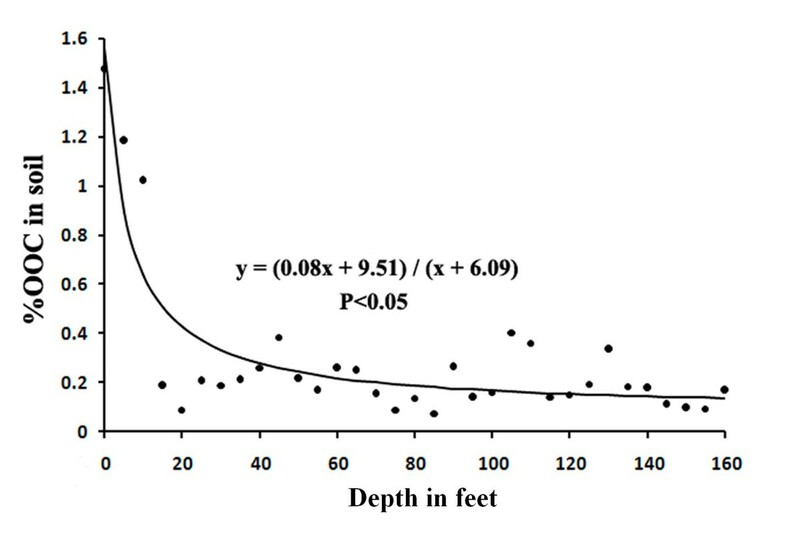 Along the depth gradient, strong significant correlations (P < 0.05) were found between soil As level and %OOC (R2 = 0.9785). This was in synchrony with the fact that As was co-deposited with OOC in soil, and the correlation between them was due to As retention and high OOC inputs in the vegetated zones of the Bengal Basin (Meharg et al. 2006). Furthermore, a previous study (Wang and Mulligan 2006) reported that organic matter might serve as binding agents, thereby reducing As mobility in soil. This study further extended the strong relationship of OCC and As observed in the current study. 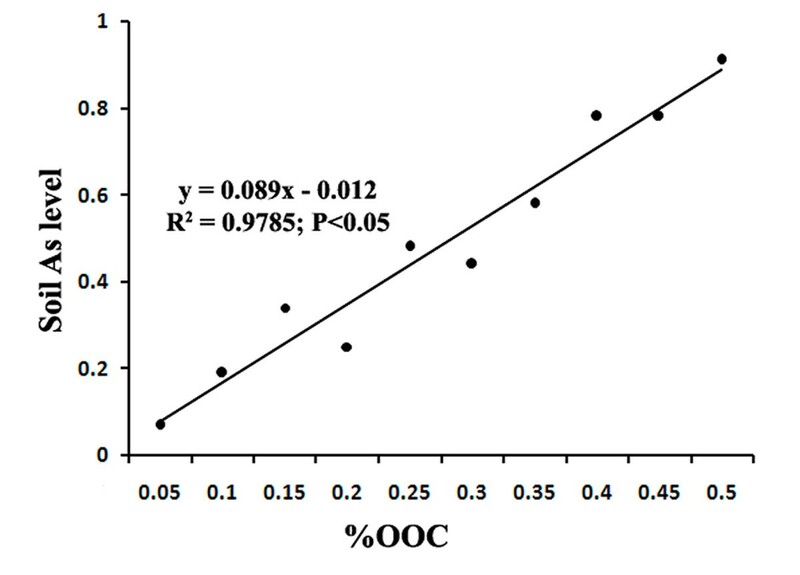 Figure 3 demonstrates the As-OOC correlation along with their respective regression data. Relationship between the As level in soil with percentage of OOC. OOC shows strong and significant positive correlation with soil As level (P < 0.05). A number of previous studies proved the relation between natural organic matter and arsenic distribution in soil and sediments. An increase in dissolved organic carbon content can promote both As(V) and As(III) solubilization in soils (Dobran and Zagury 2006). Natural organic matter may enhance the release of As from soils and sediments into the soil solution and thus can help in As leaching into the groundwater (Wang and Mulligan 2006). The main influencing factors are competition for available adsorption sites, formation of aqueous complexes, and/or changes in the redox potential of site surfaces and As redox speciation (Wang and Mulligan 2006). It has also been observed that hydrogeological features of the sediments, the proportions of Fe minerals and sedimentary organic matter, and the concentration of dissolved humic materials, all influence the accumulation and mobilization of As (Varsányi and Kovács 2006). However, the present study first reported the vertical distribution pattern of arsenic in soil in the Bengal Delta and its strong correlation with oxidizable organic carbon content of soil. The absorption of arsenic by plants is influenced by the concentration of arsenic in the soil. In Bangladesh, where irrigation is carried out with arsenic-contaminated groundwater, soil arsenic level can reach up to 83 mg/kg (Roychowdhury et al. 2005). Except in the rainy season, the agricultural land in the study area has been exposed to irrigated groundwater round the year. It can be the main reason for which there was maximum amount of arsenic found in the surface soil in the present study (2.89 mg/kg). Sometimes, the farmers used to run the shallow tube wells in the rainy season due to insufficient rain. Most of the vegetables and other crops used by the villagers were cultivated in this area and entered the local market. The bioavailability of arsenic in edible plants cultivated in Bengal Delta must be investigated in detail to understand the importance of arsenic exposure from these food sources. Intensive investigation on a complete food chain is urgently needed in the arsenic contaminated zones, which should be our priority in future researches. Additionally, in-depth study of the chemical interactions between arsenic and organic matter and organic carbon could be beneficial in this regard. SB performed the field sample collection, analysis of arsenic and oxidizable organic carbon in soil, and helped in statistical analysis. GG performed the statistical analysis. DC supervised the work. AM supervised the work. PKD helped in arsenic analysis of soil samples. MKS helped in arsenic analysis of soil samples. UCG supervised the work. All authors read and approved the final manuscript.